It all started when we were at Ikea. The smell coming from the little café made everybody to crave for cinnamon rolls. One week later, the boys wanted to bake some. I was clueless and not willing to wait and test recipes, and ended up buying a "ready to bake" frozen dough from Trader Joe's. Finally, a good recipe of Cinnamon Pinwheels was brought by one of the other mothers who cooks with me and the kids at our school's Cooking Club. Weeks in a row we baked a very fast to prepare, very silky dough, and the kids were all marveled by the possibility of sharing that recipe with their parents. We were so thankful to Asma, who showed to us how easy was to make them. For our playdate I twisted a little bit her recipe and added Darienne's favorite spice, cardamom. My sisters were visiting, and they just absolutely love vanilla. So, there went some vanilla beans in the dough. And as my attempt was to have some more nutrition, I substituted the all purpose flour to wheat. The reviews were mixed: while I thought that the fluffiness of the original recipe was missing, the crunchier surface was wonderful, and the flavors added were all there, blended and filling our home with a wonderful smell of a good bakery. Pre-heat oven to 425 F (220C). Combine flour, baking powder and salt in a large bowl. Smash butter with a fork, with the other ingredients to the point of a coarse texture. Add milk to dry ingredients and stir with the fork until a soft dough is formed. If this is too wet, add more flour. Turn dough onto lightly floured surface and knead gently up to when it feels silky and not sticky to your hands (might be something in between 8 to 12 times of kneading). 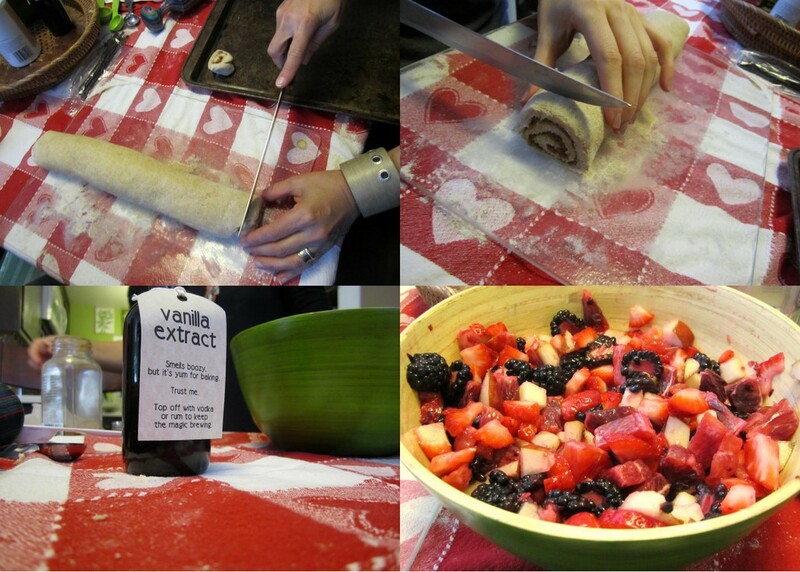 Roll pastry into a 12 inch square. Melt butter in the microwave . Add sugar, cinnamon, cardamom and vanilla extract up to when all ingredients are combined. Spread sugary mix on stretched dough from edge to edge and roll it like a jelly roll. Seal edges. Cut into approximately twelve 1 inch pieces ( I ended up always cutting about 0.5 inche and the result was a drier yet crunchier roll). Place in lined or greased baking sheet. Bake for about 14 to 20 minutes or up until golden. Serve warm. We paired them with a delicious fruit salad with blood oranges. Yum!